My research program is focused on global variability of dissolved organic matter and its interactions with metals in waters. We study organic matter and metal interactions because the presence of organic matter has been shown to decrease the toxicity of metal pollutants. My lab, and collaborators, have worked towards quantifying this protective effect so that regulators can consider this when establishing limits for dissolved metal pollutants. To universally apply these approaches we need to determine if organic matter from different sources interacts differentially with metals. The opportunity to work in Brazil, on Amazonian organic matter, fits into my overall research program. In Brazil I met Aleicia Holland who was a postdoctoral fellow working at INPA (Instituto Nacional de Pesquisas da Amazônia) in Manaus, Brazil. The Amazon Basin represents an organic matter source very different from Southern Ontario and there is even variability within in the basin, thus, we have black, white and clear waters. Our paper, "Nickel toxicity to cardinal tetra (Paracheirodon axelrodi) differs seasonally and among the black, white and clear river waters of the Amazon Basin," found that the toxicity of nickel varied between the coloured river waters, seasons, and pH in the Amazon Basin, and that nickel was more toxic at pH 7 than at pH 4. Many parts of the Amazon Basin are naturally acidic and the pH naturally varies throughout the waterways. These findings were not surprising, however what surprised us was that some organic matter actually increased Ni toxicity at these acidic pHs. This is completely different from anything we have observed for other watersheds in North America and Europe. This has significant implications because water managers in the Amazon Basin will need to take this effect into account; they cannot use the procedures usually used in temperate regions but must develop Amazon-specific methods. We are continuing this work and expanding to temperate and tropical Australian waters. 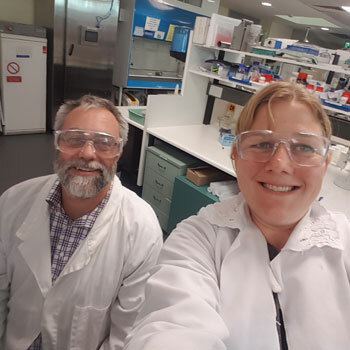 Aleicia now has a faculty position in her native Australia (Latrobe University in Victoria) and recently I visited her lab there. While in Australia, I characterized organic matter that Aleicia had collected from the North to the South end of Australia from a variety of types of watersheds. The results of this characterization, and associated toxicity testing, will allow us to provide evidence-based, region-specific metal pollution management recommendations to regulators in Australia and for other tropical regions.